Steven Carlson, performing close-up magic at The Theater in the Round, Minneapolis. Steven Paul Carlson has been the premier sleight of hand magician in the upper Midwest for over 40 years. Audience praise for Apartment 101, magic. “Steven’s command of language and storytelling parallels his prestidigitation prowess." 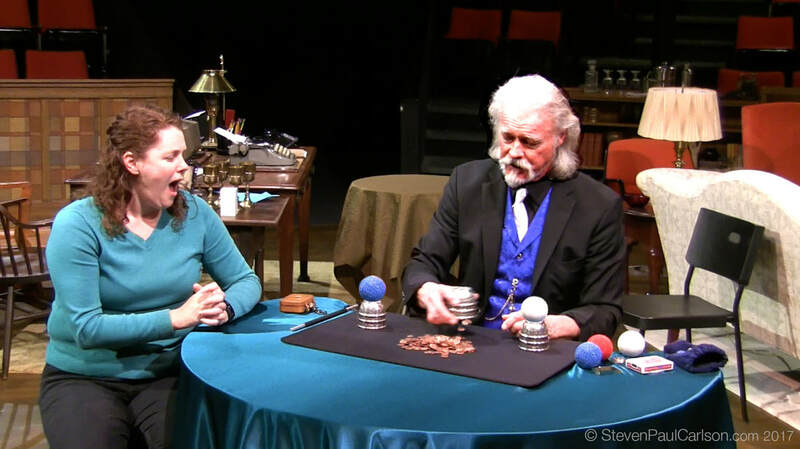 Elegant Coin Magic, Steven Paul Carlson from Steven Paul Carlson on Vimeo. Minneapolis Minnesota Magician, Steven Paul Carlson has mystified, enchanted and entertained audiences all over the USA for over 35 years. Steven Carlson is proud to present his art of sleight-of-hand magic to the Twin City area. Steven’s elegant magic will compliment and enhance any party or event, from private to corporate. Steven’s close-up magic, strolling magic, and stage magic are designed to work perfectly for any event or size of group. Steven is a master magician and an expert sleight-of-hand artist. Steven’s stunning magical performance creates a powerful, memorable experience for the audience one they will remember for many years. Contact Steven today and let him show you how his elegant Magic entertainment can help make your next event the best ever! "Magic inspires wonder and wonder gives birth to imagination."